6 July 1957 was a pivotal day for the history of modern music: it was the day that John Lennon met Paul McCartney for the first time. 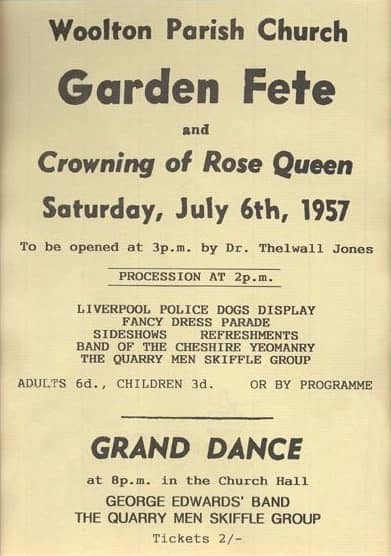 In the afternoon the Quarrymen skiffle group played at the garden fete of St Peter's Church, Woolton, Liverpool. The performance took place on a stage in a field behind the church. In the band were Lennon (vocals, guitar), Eric Griffiths (guitar), Colin Hanton (drums), Rod Davies (banjo), Pete Shotton (washboard) and Len Garry (tea chest bass). The group arrived on the back of a lorry. As well as music, there were craft and cake stalls, games of hoop-la, police dog demonstrations and the traditional crowning of the Rose Queen. The fete was a highlight of the year for the residents of the sleepy Liverpool district. The entertainment began at two p.m. with the opening procession, which entailed one or two wonderfully festooned lorries crawling at a snail's pace through the village on their ceremonious way to the Church field. The first lorry carried the Rose Queen, seated on her throne, surrounded by her retinue, all dressed in pink and white satin, sporting long ribbons and hand-made roses in their hair. These girls had been chosen from the Sunday school groups, on the basis of age and good behaviour. 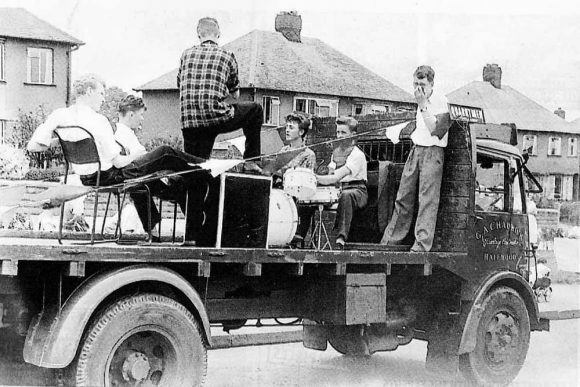 The following lorry carried various entertainers, including the Quarry Men. The boys were up there on the back of the moving lorry trying to stay upright and play their instruments at the same time. John gave up battling with balance and sat with his legs hanging over the edge, playing his guitar and singing. He continued all through the slow, slow journey as the lorry puttered its way along. Jackie and I leaped alongside the lorry, with our mother laughing and waving at John, making him laugh. He seemed to be the only one who was really trying to play and we were really trying to put him off! That evening the group were due to play again, minus Colin Hanton, this time at the Grand Dance in the church hall on the other side of the road. They were due on stage at 8pm, and admission to the show, in which the Quarrymen alternated on stage with the George Edwards Band, was two shillings. Copies of the recording can be found on youtube and elsewhere on the internet. How lovely, my Grandmother was one of the women running this village fete, my six year old mother was there also. The 6th of July is also my Birthday. I was born on July 6, 1957! I always felt there was a spiritual connection with John Lennon & Paul McCartney and myself. that is unbelievably awesome. lucky you. I was born July 6, 1957, too!!! And I saw McCartney (from the 10th row) in Miami July 7 (the birthday of Paul’s father and Ringo! ), 2017 for my 60th birthday. Sometimes you look at some sites and they get times and dates wrong… tis funny that Paul, who was there, so you think he would know, got their ages wrong when they met. He says’ they were 12 when actually he was fifteen and John sixteen…. you see, even when it’s from the horse’s mouth, it ain’t always right! ….I realised he was drunk. We were twelve then, but, IN SPITE of his SIDEBOARDS, we went on to become teenage pals. “…he left school and played with a group called the Beatles, and here he is with a book. Paul didn’t get their ages or anything WRONG. Just joking of course. “I was bored on the 9th of Octover 1940 when, I believe, the Nasties were still booming us led by Madalf Heatlump. Yes,exactly. He was just emphasizing the fact of how young they were. Paul also mentions John’s beery breath and that he was drunk. Paul had just turned 15 at the time and John was going on 17. John was just a bit short of being a year and 8 months older than Paul. For people in their mid teens, that can make quite a difference. Add that to the fact of their very different upbringings…meaning that the way John grew up would make grow up quicker and Paul’s would make him on the young side and more innocent for his age. Paul still felt like a kid. He saw John as being more worldly, this evidently had an impact on him. He’s pointing out that they were very young, but very different. He was using the term sideboards (sideburns) mostly figuratively. John had his first band before Paul. I am sure he didn’t need to know how to tune a guitar or play ukele chords. Something isn’t right there. Someone is really trying to gain credit. Even in the photo here John knew chords. I don’t know how some run him down. Including Paul. John was the heart of the Beatles. Lol, what’s said in the article is true, whether some Lennon fans like it or not. His fisrt band was precisely The Quarrymen, which Paul would join. He didn’t know how to tune in a guitar, not many people knew then. He played banjo chords, tuning to the A string and leaving the bottom E string loose. John didn’t know how to tune to standard guitar tuning. His mother, Julia, played banjo, so she taught him how to tune a guitar like a banjo, and taught him banjo chords. Paul taught him “proper” guitar tuning and chords. -The recording seems to have 2 versions of ‘Puttin’ on the Style’, one quite slow and one fast. Strange that they said it was without Colin Hanton because there are very loud drums on the faster version, and the recording is said to be from the evening performance. -In the picture of them playing in the field, JOhn seems to be playing a regular G chord on his guitar. Great story Roy, that is amazing that you were there. i met john in June a few weeks before he played with the Quarrymen. He was staying in Largs in Ayrshire with his cousin Stan. He said he wanted to be as big as Elvis and that he had a skiffle group with his friend Pete and that his mother had taught him to play the banjo. I laughed and said he’d never make it with a banjo. I knew him over the course of three weeks. I was ten years old and I must say John was a big and sometimes a bad influence, stealing unashamedly from Woolies and Simpsons the local store. My little brother was Downes Syndrome and John had a thing about disabled people. He would point and laugh hysterically at them. There was something lacking in his upbringing I would say,maybe not his fault. We both loved the Goons and Hancock and he did turn me on to Rock and Roll. He knew even then about the beatniks and told me they were Cool!!! On a trip doon the watter on the Talisman John stood at the prow and said “I made all this!” I would say he had a bit of a God complex. I loved the guy, and in the absence of my two best friends who were on holiday and never met him we were as thick as thieves! My grandmother said of John, “He’ll go far that laddie, gin they dinna hing him”, and I think she got it about right! We fell out over his attitude to my brother. My father told me he was a bad influence and to ignore him in the street. I did as I was told and hid round the corner when he shouted,”Don’t turn your back on me!” i never saw him again in the flesh but of course he was everywhere and I loved the music! And always will! Thank you for sharing your recollections, Ian! They were lovely to read. Thanks for the memories, Ian. I have no doubt about your observations and conclusions of John. Just a dumb question from a dumb Yank …..why is it on the first ad the date is July 6, 1957 which isn’t the way the date is written in U.K. but the date on the programme is correct? There’s not a standard UK way of writing dates in this way. Sometimes it might be 6 or 6th July, other times it might say July 6 or 6th. It really depends on the writer’s preference. That said, it’s probably more common nowadays to write it the first way, with the number before the month (and if we were abbreviating it we’d always write DD/MM/YY, not MM/DD/YY). 60 years ago to the day. Yet another proof of why the universe is based on randomness. If this rendezvous would not have happened- not only that these two amazing talents on their own right would have never achieved the level of creativity that they have achieved together (certainly driven by fierce competition), our own life would have been totally different and duller. We are blessed that the two did meet. 61 years ago today… Wow… It feels like something that could happen everyday around here.